The designers of the prestigious house of haute coiffure took a stroll through history to bring us the breathtaking looks of their Heritage Collection. Inspired from the grand looks of queens and goddesses of bygone centuries and mythical lands they created a series of six elaborate and beautiful hairstyles that invite us to spread our wings and to transform into the glamorous and regal female that we were born to be. 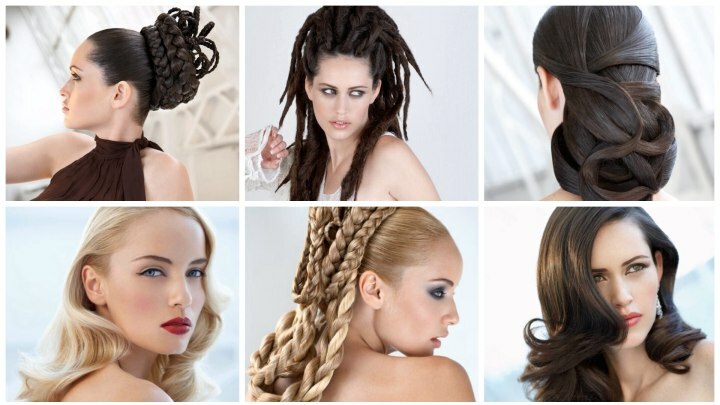 The Heritage collection features the most amazing textures and structures, smooth waves, artistic braids and even dreadlocks. It is an eclectic mix of cultures, continents and centuries. The hands of modern masters have touched up the influences of the past. They created masterpieces whose era is still to come. Long brunette spiral curls and a large smooth section reaching from the crown all the way to the chin is the stuff that luxury is made off. The generous curls and waves are almost too beautiful and perfect to be real. The face is framed by the most elegant line that originates where the side part meets the forehead above the temple. 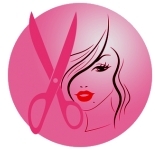 From here the hair flows in a smooth curve along the shape of the face while the other side gently exposes the ear. The icy blonde waves cascade over the shoulders like liquid gold. An inherent fire melts glaciers and looks like it could contribute to global warming. With some inspiration of the film noir and stars like Catherine Deneuve or "La Dolce Vita" Anita Ekberg, this look will take every woman to fashion heaven and turn her into a timeless icon. Long, slicked strands of hair were wrapped around and on top of each other to create a classic shape that was taken to the 21st century. Exact partitioning of the hair and good pomade that does not add too much weight are the start of this unique up-style. 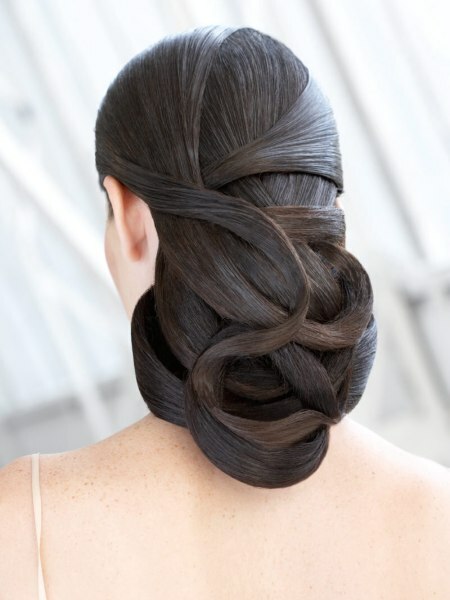 The creativity and skill of a master coiffure puts the right curves into this beautiful knot. Aphrodite reborn. The old master painters would have gone crazy over the elaborate structure of this model's hair. Braids of all sizes from super thick to finger thin are wrapped in generous loops around the back of the head and around each other. The tiniest braid is woven to accent the creation. There might be enough real hair on one head for this look, but plenty of faux braids are ready for purchase. With this crown of braided hair you will keep your head up high and bask in your newfound regal attitude. Around the center of strictly pulled back hair enormous braids were wrapped to form a round base of about the same diameter as the head. Smaller, very long braids were arranged in a coiled scenario that adds an even more surreal princess touch to this unique retro-futuristic look. Princess Leia, watch out! These are not your everyday dreadlocks. Each one of the matted strands was designed to its specific shape and direction. Large rolls of hair first move away from the face and put much weight and volume on to the crown. From here they flow and sway freely where the rhythm and the wind want them. This extravagant look has it all - a little bit of Jamaica, a touch of Star Wars and the flair of a great Parisian Salon.